This week's Sunday Night Suds looks at another of the fine and well priced beers available at Trader Joe's - the Alternate Dimension Altbier Ale. A Düsseldorf specialty, an Altbier is a German style brown ale, the "alt" literally translates to "old" in German, and traditionally Altbiers are conditioned for a longer than normal periods of time. Other sources note that "alt" is derived from the Latin word "altus," which means "high" and refers to the rising yeast. Take your pick, but the extended conditioning mellows out the ale's fruitiness and produces an exceptionally smooth and delicate brew. The color ranges from amber to dark brown, medium in carbonation with a great balance between malt and hops. 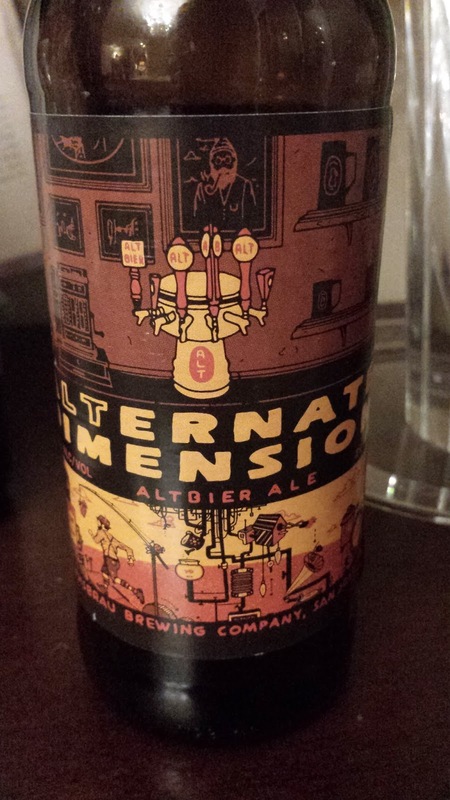 This Alternate Dimension is very different from the color definition as it was almost as dark as a Guinness Stout. KBjr described it as having an acetic flavor, which I guess could have been a result of the yeast. To me, the beer had an interesting development of fruit as it was almost a stone fruit flavor. There was some breadiness as well and some pine, but the hops were not forward. The label indicated that the beer is 5.6%abv, but the alcohol flavor was completely masked by the other interesting notes in the brew. I would pair this with rich stews, charred meat and other savory faire. If you have some pairing that you enjoyed, please post it in the comments below. To see what the experts on Beer Advocate think about the brew, please follow this link www.beeradvocate.com/beer/profile/10707/320778.